Sometimes called a line finish, this finish is achieved by sanding in a vertical direction using approximately a 150-180 grit abrasive sandpaper. 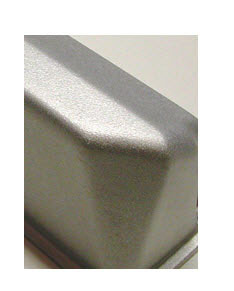 This is one of the most common stainless steel finishes used in architectural metal work. 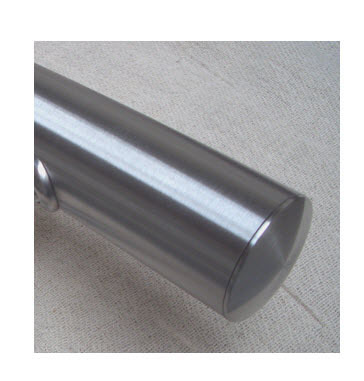 An example of a #4 polished railing. A finer grain finish with a brighter sheen, requires sanding as above but also buffing with a buffing compound on a cloth wheel. The quality of the surface depends greatly on the amount of sanding done and the fineness of the abrasives used. This finish provides a dull matte finish. For best result glass beadsare used. It is relatively cost effective and has a nice uniform matte appearance. One drawback however is it is susceptible to finger print staining. A high polish stainless finish look much like chrome. As the name implies, a mirror polish will result in a highly reflective finish. Mirror polishing requires significant amount of buffing to achieve. While polishing, great care must be taken to remove deep scratches. Any defects will “show through” and be quite noticeable once you reach the final stage. One benefit of mirror polishing stainless steel is that it improves its corrosion resistance. This is because it removes crevices where corrosion causing chlorides can sit and do their work.